In presidential politics "Red State" means Republican, "Blue State" Democrat, and purple denotes battleground or "Swing State" -- a state where no single candidate or party has the majority support to secure that state's electoral college votes. These competitive states are the best opportunity to pick up electoral votes, and are the key to winning or losing the White House in 2016 -- particularly for Democrats. Solid Republican: Alabama, Alaska, Idaho, Kansas, Montana, North Dakota, Oklahoma, South Carolina, South Dakota, Tennessee, Utah & Wyoming. 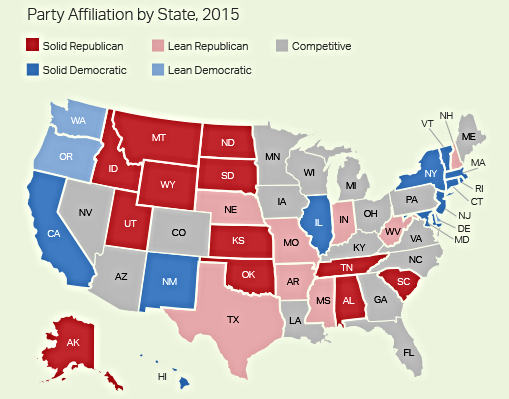 Leaning Republican: Arkansas, Indiana, Missouri, Mississippi, Nebraska,*New Hampshire, Texas & West Virginia. California, Connecticut, Hawaii, Illinois, Maryland, Massachusetts, New Mexico, New York, New Jersey, Rhode Island, & Vermont. (DC & Territories were not included in the analysis). Although Gallup slates the following 16 as competitive, most pundits would say the presidential hinges on battles in a crucial ten states. Competitive States: Arizona, Colorado, Florida, Georgia, Iowa, Kentucky, Louisiana, Maine, Michigan, Minnesota, Nevada, North Carolina, Ohio, Pennsylvania, Virginia & Wisconsin (Note: New Hampshire is considered by most to be in the top ten). We will keep you informed as the battles unfold! If you appreciate the resource, please help DemList with a Contribution today and contact us for advertising options for getting your message out!